Over the past three years, I have become more and more distanced from my local running friendships, and a couple of Facebook conversations this week prompted me to share my conclusion that in-person running friendships are not something to take for granted, that despite your specific training plans which may make it hard to “lace up and go” together, it’s worth figuring out how to make it work. 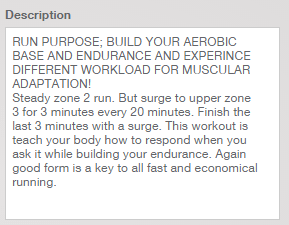 A typical “with surges” workout in Training Peaks. Related to this change, I began isolating myself from group runs I previously had participated in. In addition to the specificity of the workouts, my first coach did not want me racing as much as I had been (translation: almost every Saturday). The withdrawal from frequent racing made sense from a training standpoint but took me further away from the Saturday morning visit/run/sweat/eat routine. My initial goal of being coached was to prepare for my first half marathon (September 2012) but after that I was single-focused on my goal of the sub-30 5K. That’s why I stuck so religiously to the “less racing” and “more following coach’s instructions to the letter” plan even though it meant being separated from my running peeps. To be fair, a certain amount of my running has always been solitary. Early morning runs before work are sometimes more easily accomplished by just knocking them out in the neighborhood. I’m not always able or willing to meet a group at 7 a.m. on a Saturday. I love running alone but I also love the people in my running community. The farther I got into my little training world, the more distance grew between my local running friends and me. 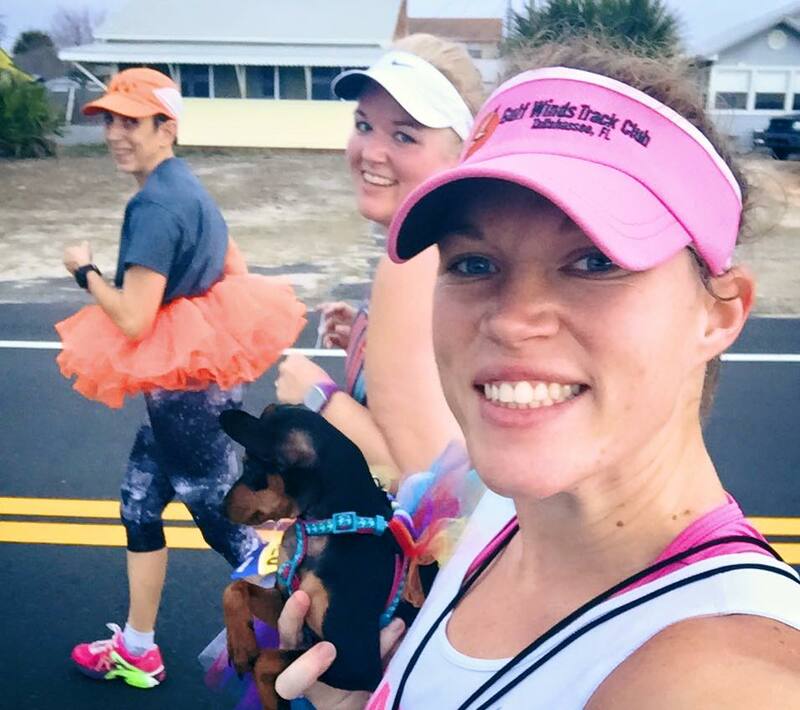 I can’t say exactly when I began refusing to accept the impact my coaching plan had on my local running friendships, but I saw a subtle shift about a year and a half ago, when I started meeting a group of Moms Run This Town (MRTT) runners on Tuesday and Thursday mornings at 5:30 a.m. for their runs. I was always the “caboose” and still running alone but it made a difference to start out with a group, to say hello to friends, and for someone to know I was out there (and to have a change of scenery from my neighborhood loop). 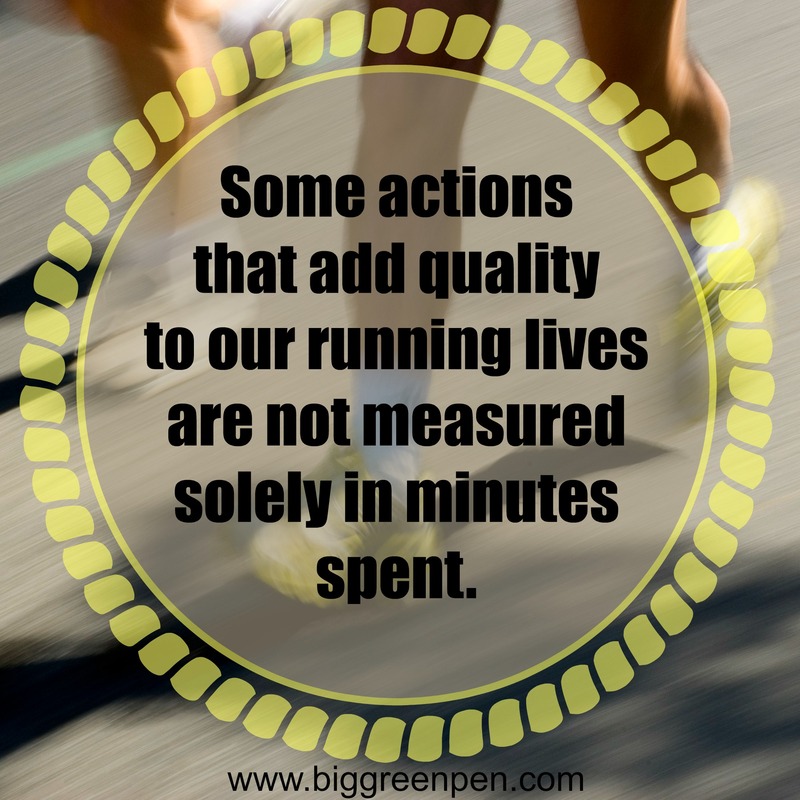 It was a little silly to drive 20 minutes there and 20 minutes back, sometimes for a 40 minute run, but some actions that add quality to our running lives are not measured solely in minutes spent. The term “local running friends” should be broadly interpreted to include Miniature Pinschers, of course. The more obvious shift came when I began experiencing challenges with my heart rate, leading to my April 2015 EP study and diagnosis of multifocal atrial tachycardia (MAT). Because an ablation was contraindicated (for now), I am currently taking a beta blocker half an hour before I run and, although I am sure there are plenty of runners out there accomplishing a sub 30 5K on beta blockers, I am dubious that is in the cards for me, so I am re-assessing my goal. And it bothers me that before I got to the point of reassessing that goal, my path took me farther and farther from my local running friends, leaving me with a goal unaccomplished (I hate that!) and social bridges whose support pilings were on the verge of being washed out due to neglect.